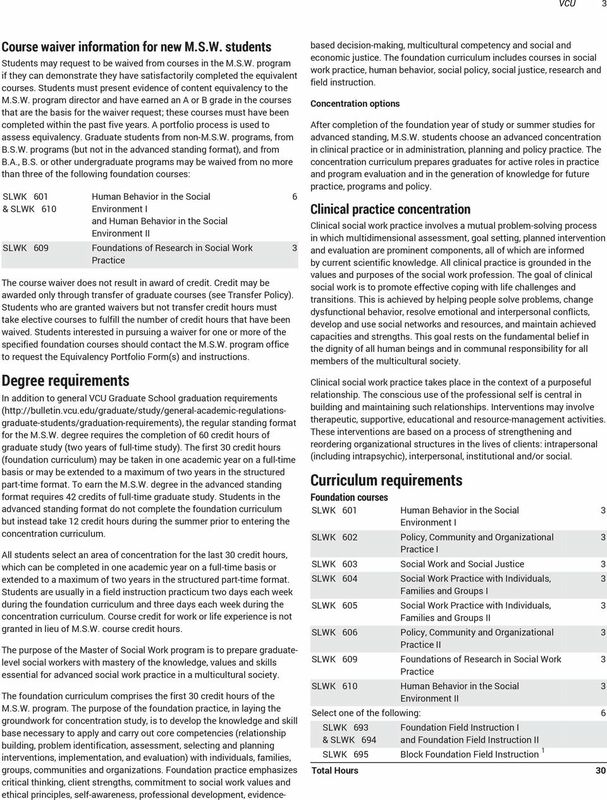 Download "SOCIAL WORK, MASTER OF (M.S.W.) 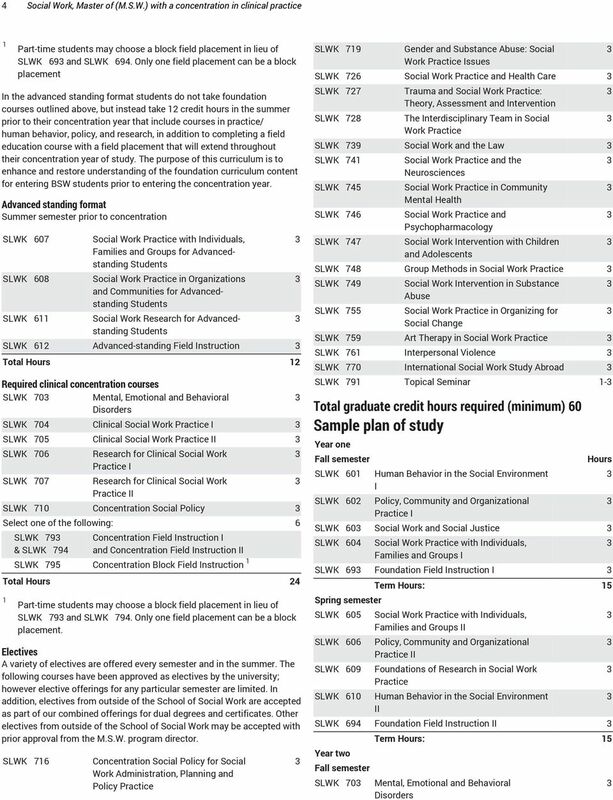 WITH A CONCENTRATION IN CLINICAL PRACTICE"
2 2 Social Work, Master of (M.S.W.) 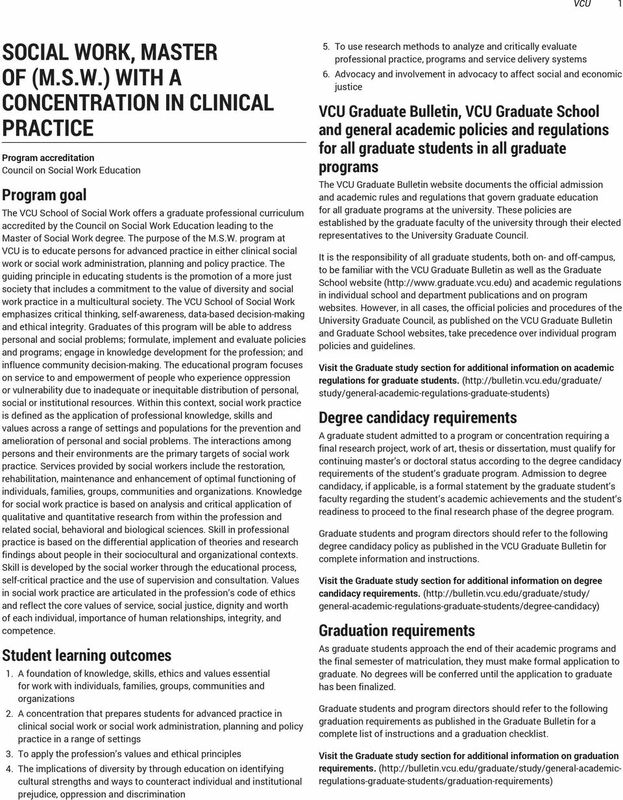 with a concentration in clinical practice Apply online at graduate.admissions.vcu.edu ( Admission requirements Degree: M.S.W. Semester(s) of entry: Summer (advanced standing format) Deadline dates: Dec 1 Fall (regular Jan 16 standing formats all on-campus part- and full-time and distance education) Special requirements Test requirements: The School of Social Work requires a specific outline for the personal statement that is different from what is shown in the graduate admissions website and also requires that a checklist be submitted with application materials. Please visit the School of Social Work website for this specific information. Full-time, part-time and distance education format applicants are admitted to begin study in the fall semester only. Advanced standing format applicants are admitted for the summer session only. At the time of application, applicants may apply for only one of the following: full-time on-campus Richmond, part-time on-campus Richmond, part-time distance education or advanced standing. 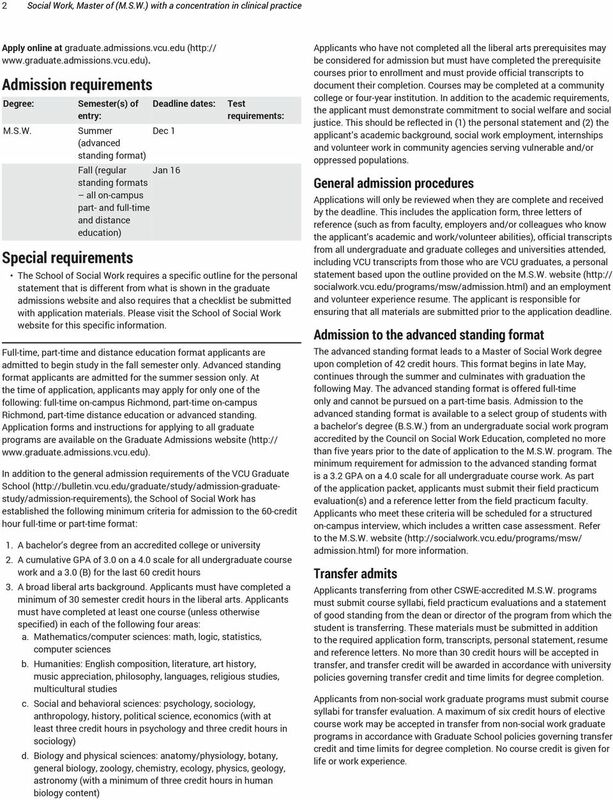 Application forms and instructions for applying to all graduate programs are available on the Graduate Admissions website ( In addition to the general admission requirements of the VCU Graduate School ( the School of Social Work has established the following minimum criteria for admission to the 60-credit hour full-time or part-time format: 1. A bachelor s degree from an accredited college or university 2. A cumulative GPA of.0 on a 4.0 scale for all undergraduate course work and a.0 (B) for the last 60 credit hours. A broad liberal arts background. Applicants must have completed a minimum of 0 semester credit hours in the liberal arts. Applicants must have completed at least one course (unless otherwise specified) in each of the following four areas: a. Mathematics/computer sciences: math, logic, statistics, computer sciences b. Humanities: English composition, literature, art history, music appreciation, philosophy, languages, religious studies, multicultural studies c. Social and behavioral sciences: psychology, sociology, anthropology, history, political science, economics (with at least three credit hours in psychology and three credit hours in sociology) d. Biology and physical sciences: anatomy/physiology, botany, general biology, zoology, chemistry, ecology, physics, geology, astronomy (with a minimum of three credit hours in human biology content) Applicants who have not completed all the liberal arts prerequisites may be considered for admission but must have completed the prerequisite courses prior to enrollment and must provide official transcripts to document their completion. Courses may be completed at a community college or four-year institution. In addition to the academic requirements, the applicant must demonstrate commitment to social welfare and social justice. This should be reflected in (1) the personal statement and (2) the applicant s academic background, social work employment, internships and volunteer work in community agencies serving vulnerable and/or oppressed populations. General admission procedures Applications will only be reviewed when they are complete and received by the deadline. This includes the application form, three letters of reference (such as from faculty, employers and/or colleagues who know the applicant s academic and work/volunteer abilities), official transcripts from all undergraduate and graduate colleges and universities attended, including VCU transcripts from those who are VCU graduates, a personal statement based upon the outline provided on the M.S.W. 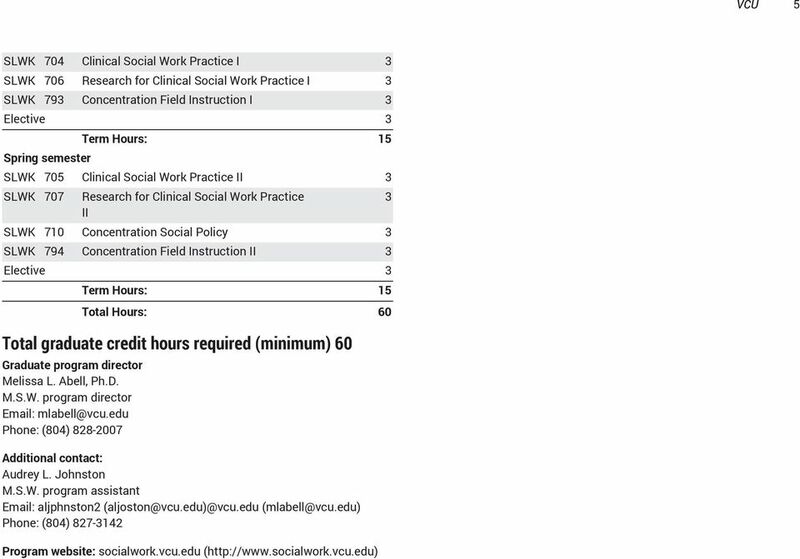 website ( socialwork.vcu.edu/programs/msw/admission.html) and an employment and volunteer experience resume. The applicant is responsible for ensuring that all materials are submitted prior to the application deadline. Admission to the advanced standing format The advanced standing format leads to a Master of Social Work degree upon completion of 42 credit hours. This format begins in late May, continues through the summer and culminates with graduation the following May. The advanced standing format is offered full-time only and cannot be pursued on a part-time basis. Admission to the advanced standing format is available to a select group of students with a bachelor s degree (B.S.W.) from an undergraduate social work program accredited by the Council on Social Work Education, completed no more than five years prior to the date of application to the M.S.W. program. The minimum requirement for admission to the advanced standing format is a.2 GPA on a 4.0 scale for all undergraduate course work. As part of the application packet, applicants must submit their field practicum evaluation(s) and a reference letter from the field practicum faculty. Applicants who meet these criteria will be scheduled for a structured on-campus interview, which includes a written case assessment. Refer to the M.S.W. website ( admission.html) for more information. Transfer admits Applicants transferring from other CSWE-accredited M.S.W. programs must submit course syllabi, field practicum evaluations and a statement of good standing from the dean or director of the program from which the student is transferring. These materials must be submitted in addition to the required application form, transcripts, personal statement, resume and reference letters. No more than 0 credit hours will be accepted in transfer, and transfer credit will be awarded in accordance with university policies governing transfer credit and time limits for degree completion. Applicants from non-social work graduate programs must submit course syllabi for transfer evaluation. A maximum of six credit hours of elective course work may be accepted in transfer from non-social work graduate programs in accordance with Graduate School policies governing transfer credit and time limits for degree completion. No course credit is given for life or work experience. MASTER OF SOCIAL WORK ADVANCED STANDING ADMISSIONS APPLICATION SUMMER 2015 Revised 1/5/2015 Dear Advanced Standing Applicant: Thank you for your interest in the UNLV Master of Social Work (MSW) Program. The Professional Bachelor of Social Work (Honors) Program at King s Social Work is a dynamic and evolving profession. Preparation for professional practice begins with the Bachelor of Social Work (Honors). Degree plan filed through student's advisor. Maintain a B average with no grade lower than B in core courses. COUNSELOR EDUCATION Web: http://www.emporia.edu/ce/ Phone: 620-341-5220 James Costello, Chair Graduate Faculty: Professors: Katrina Miller. Associate Professors: James Costello, Russell Fulmer, Ann M.
Program Approval Form For approval of new programs and deletions or modifications to an existing program. Action Requested: Type (Check one): X Create New (SCHEV approval required except for minors) B.A.